Although it’s been a hot minute since material has been posted here, the Williams College BSU has been going strong. Below are a few highlights from Fall 2013. We kicked off the year with our annual BBQ in Morley Circle, attracting students and faculty with the fumes of deliciousness. Qadir Forbes, Tre’dez Colbert, and Ahmad Greene threw down on the grill, serving up hot dogs and hamburgers. For many students though, conversation was the main course. There was much catching up from the summer and many new introductions as students from all class years plus a few faculty members mixed and mingled. On September 29th, Dr. Joyce Foster, head of Academic Resources, graced our general meeting with her knowledge and expertise about how to excel by navigating the wealth of academic resources that Williams has to offer. Dr. Foster explained the procedures for peer tutoring, the Math and Science Resource Center, the Writing Workshop, and special accommodations. She debunked the myth of effortless perfection and emphasized the opposite—the top performers are the ones avidly getting help. The U took advantage of her presence, engaging in a dialogue about study habits and where to go for all academic needs. Everyone, from the first-year students to the seniors, gleaned valuable information from this meeting. On October 3rd, we packed Rice House for our Student Faculty Mixer. 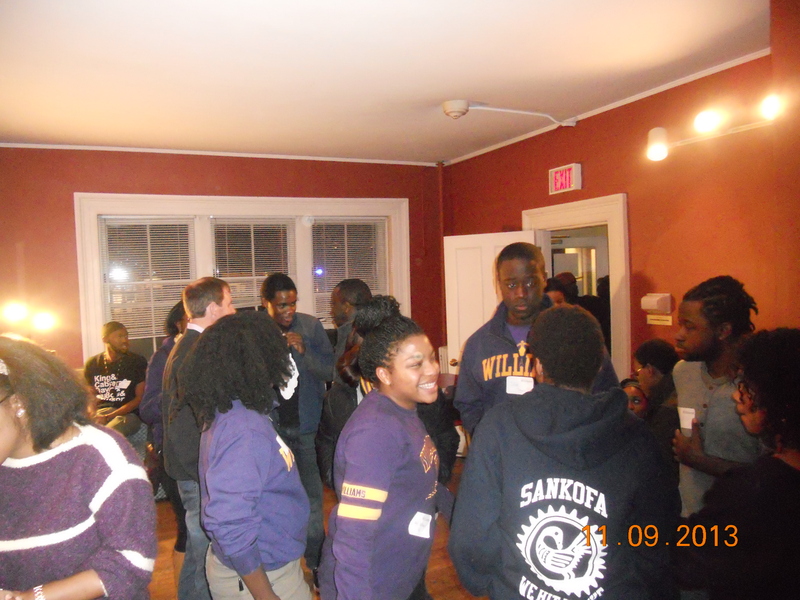 Thirty-seven students and eight faculty members representing the Davis Center, Academic Resources, the Dean’s Office, the Africana Department, and the English Department attended the event. In an interesting twist on speed dating, students and faculty shifted between timed conversations. After the organized chaos of the main activity, people broke into side conversations. The event offered an opportunity for people who might not talk otherwise to chat in a relaxed, informal setting. contacts. Special thanks to Bryan Thomas ’12 of WBAN and Adrianna DeGazon ’16 for their hard work in coordinating the event. If you missed any of these events, don’t fret. Black History Month 2014 is around the corner, and the BSU has been grinding to organize programming. Stay tuned; I will be posting a preview of what is to come in the month of February in the near future. The 2012-13 BSU Board would like to analyze Rice House to obtain a more thorough and comprehensive understanding of how this space factors into present students’ experiences and past alum experience here at Williams. Among these will be how the space was used, what it meant and what perhaps was missing from Rice that you wish future students had or think were missing from your time.The board will assess your responses, and we will do our best to integrate all opinions in a formal report that will be discussed at a general meeting in the near future. Also, if their are any other experiences from your experience with the BSU in general, or advice to future U members that you wish to share as part of organizational memory, feel free to share these as well. All responses can be sent to dp2@williams.edu with the subject line “BSU Institutional Memory”.